Recently, SoxProspects Director of Scouting Ian Cundall traveled to the Fall Instructional League to report on the goings-on in Fort Myers. This is the second of four reports from his trip. For part one click here. - Simon Mercedes did not have his best fastball during the outing I saw, but he made up for it by showing two potential plus secondary pitches. Mercedes looks all of his listed 6-foot-4, 245 pounds, and is on the soft side with a large lower half. His mechanics are rigid, with a stiff landing leg that results in him finishing off balance and falling off to the first-base side. He also has the tendency to drift at times, and can thus lose his line to the plate. His fastball sat 91-93 mph, showing some sink, but lacked the crispness it has had in past looks. His secondary pitches, on the other hand, showed much better than previous looks. His threw his slider 84-87 mph with two-plane break and solid depth through the zone. It showed the potential to be swing-and-miss pitch at the highest level. His changeup showed similar potential. He threw it 84-87 mph as well, with the same arm speed as his fastball. The pitch had almost splitter-like movement at times, with the bottom falling out of it. He ended up recording three strikeouts with the pitch in this outing, all swinging, with hitters having little chance against it. Mercedes has shown the potential to have at least two plus pitches and potential third solid-average one, but his future likely lies in the bullpen. He has had trouble staying healthy and has problems with consistency, rarely getting all of his pitches working in a given outing. - I wrote about Jose Almonte back in the spring (link) and not much has changed over the last year. 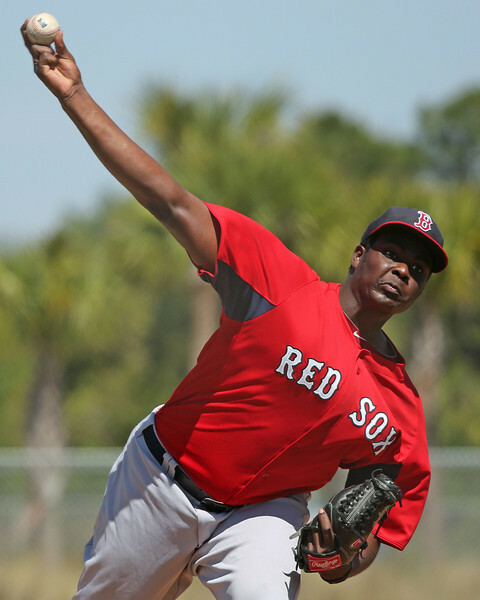 Almonte is still thin and looks lighter than his listed weight of 185 pounds. His frame does not look like it can support much added weight either. His arm action is funky, with a stab and hook behind and he pronates his wrist so that his fastball has cutter-like movement. He throws over the top with a medium leg lift. His fastball sat 88-90 mph, touching 92 mph once, with natural cut. His curveball is a true 12-to-6 offering at 75-76 mph and flashes some potential when he snaps it off. His 83-85 mph changeup was inconsistent, on the firm side sometimes, while showing fade and drop on others. Still only 19 years old, Almonte has age on his side, but he needs to make significant improvement to profile as a major leaguer. - With Enmanuel De Jesus, context is necessary to understand the full story. De Jesus will not turn 18 until December, so he is the same age as a high school senior in the U.S. In Instructs, he is facing more experienced hitters, including former college draftees as old as 23. With that in mind, De Jesus is far from a finished project and there are a lot of ways his development could go, but he has some things going for him that give him a chance. First, he has a highly projectable pitcher’s frame. Listed at 6-foot-3, 190 pounds, he is on the thin side at present, but he has a frame that could support added weight. His arm is currently on the slow side and his fastball lacks life. During this outing he worked 88-90 mph with the pitch. He complemented it with three secondary offerings: a long, sweeping curveball from 69-72 mph; a loose, short slider at 82-83 mph; and a firm 82-85 mph changeup. The changeup did show cut on one occasion. All of the secondaries need work, but that is to be expected at this stage of his development. He did show some feel for the offerings, which is a positive sign. - 2014 11th-rounder Jalen Beeks is undersized, sporting a 5-foot-11, 180-pound, stocky, filled-out frame with limited projection. His delivery is rigid, with a long arm action and hook behind and a slight drop-and-drive. His fastball primarily worked 90-91 mph, with some cut. Beeks turns his back on the hitter in his delivery before coming forward, providing some deception because hitters get a late look at the pitch. He showed feel for his secondary pitches in this outing, but neither looked like a future potential plus offering. His slider showed short, late break in the low-80s. His changeup worked at 79-81 mph and was inconsistent. He seemed to slow his arm down on some changeups, but was able to pull the string on others that showed drop.